Kevin Rothstein and Mike Beaudet, of WCVB-TV in Boston, are the 2017 recipients of the Eugene Katz Award for Excellence in the Coverage of Immigration. This year was the 20th anniversary of the award, which is intended to highlight good reporting on a topic when sentimentality and unquestioned assumptions are the norm. The keynote speaker at the award luncheon in Washington, D.C., was Barbara Gonzalez, Acting Assistant Director of Stakeholder Engagement at Immigration and Customs Enforcement and head of ICE's new Victims of Immigration Crime Engagement (VOICE) Office. Location: Murrow Room, National Press Club, Washington, D.C.
MARK KRIKORIAN: Good afternoon, folks. I don’t want to interrupt anybody’s eating. Please continue to eat. In fact, no one’s allowed to leave until all the food is done since I’ve already paid for all of that, so please eat up. But we’re going to get the program started for people who, you know, have to work for a living eventually and get back to the office. My name is Mark Krikorian. I’m executive director of the Center for Immigration Studies. And what we’re presenting today is our Katz journalism award, the Eugene Katz Award for Excellence in the Coverage of Immigration. We’ve been offering this award for a long time now, I think it’s 20 years actually. Hold on. Actually, oh, OK, this is 20 years we’ve been doing it. I knew it was something like that. I’m actually surprised, but delighted. We started this award back in 1997 honoring a board member, who has since passed away, Eugene Katz, whose family was actually involved in media. He worked at The Daily Oklahoman as a reporter and then his family had a radio advertising business and took over that business. The industry has changed dramatically, but it was a huge player in the radio advertising business and they actually owned a number of stations as well. And to honor him on his 90th birthday, we started this award. I’ll get to who the honoree ‒ I’ll introduce him, actually two of them, one is here representing his colleague, but we’re starting with a speaker who is going to talk a bit about media coverage of immigration. And I think we have an ideal person to do that. Barbara Gonzalez is now acting head of the VOICE Office, this is the victims services office that was started by this administration within ICE, Immigration and Customs Enforcement. But Barbara has been with ICE since it was started, and was at the INS before that and has had a whole variety basically of public affairs, media affairs positions. She was ICE’s press secretary. She was head of public affairs, acting, I think, head of public affairs for a while. But the point is she has been dealing with reporters covering immigration issues for a couple of decades now, and at ICE, more than, say, USCIS, for instance, that’s, you know, combat duty, if that’s the right way to put it. So I think Barbara is actually probably the person who’s most qualified probably in the whole country to tell you about the defects in immigration reporting and maybe some of the strengths as well. So we’re going to have Barbara regale us hopefully with some good stories, too. It would be great if there’s some ‒ you can take the names out if you want, but I’d love some horror stories. And then I’ll introduce our honorees. BARBARA GONZALEZ: Oops, sorry. Good afternoon. I’m going to actually take this out of here because my notebook is bigger than, I think, the entire podium, so I’ll put this right here if you don’t mind. I’d like to thank everyone for joining us today. And I’d like to thank the Center for Immigration Studies for inviting me to speak today. It’s my honor to represent the men and women of U.S. Immigration and Customs Enforcement. Journalism is a topic of discussion throughout the world. In fact, if you poll people in our community, I’m sure everyone will have an opinion of today’s state of affairs in the journalistic world. Some may argue that it’s slanted, not accurate, not fair, misleading or misinformed, among other things. Because of this, today’s award is significant. When you ask a child what they want to be when they grow up, they’ll often tell you a doctor, a lawyer, a policeman and, yes, some will say reporter. I assure you that children who want to be reporters are, at the core, explorers, inquisitive and smart. They have big dreams and aspirations of changing the world through their reporting. They go to college, they graduate and they start off in the workforce wanting to make a difference. So what happens between wanting to make a difference in the world and hitting the job market and realizing that everything is not as idealistic as you had imagined? There are deadlines, pressures, breaking news, shrinking budgets and, frankly, not enough time to do the type of the reporting that they had studied and, yes, dreamed they’d do. Then to top it off, you’re assigned a topic as complex, nuanced, and emotional as immigration. Immigration reporting has, in my opinion, never been more important than now. Why? Because journalists are reporting on laws and policies that impact millions of people because what they write matters, because what they write can influence people’s opinions, but, more importantly, because what they write can save lives. There are people around the world who are contemplating coming to the United States unlawfully, people who are susceptible to the lies of smugglers. I’ve met some of these people and it is gut-wrenching to see the things that they are told by these smugglers. A lot of them are selling their lands, a lot of them are putting themselves in great debt and at great risk in the hands of these smugglers who really have no regard for them. They could be their countrymen, they could say I really want to help you, but they don’t. All they want is to make a quick buck. All they want is money. So all these people that are around the world that are contemplating coming to the United States unlawfully, they are susceptible to those lies that these people are selling them. The lies that they tell them to come to America, the lies that they tell them that it’s OK to come, that they can stay, that there are permisos, permits, which is one lie that has really been told for years and years in Latin America. What they read in the paper, what they see on TV, what they hear on the radio can influence their decision on staying or leaving their home countries. It can indeed save their lives. Today we honor journalists who, despite shrinking budgets and pressures, are trying to get immigration reporting right, journalists who understand that the stakes are high, who understand that what they say matters. I’ve seen firsthand the impact that our statements have. I’ve traveled through Central America, as I’ve referenced, talking to people about the dangers of illegal migration, the dangers of falling into the hands of smugglers. I’ve had difficult interviews and conversations, some even taking me to remote highlands in Guatemala. I’ve done this because, like journalists, I, too, want to convey a message. I, too, want to effect change. I, too, want to save lives. Sadly, America has been portrayed as anti-immigrant. That cannot be further from the truth as before you stands a Hispanic American, a woman who came as a small child from a communist country, a woman whose parents were seeking a better life for their children, a woman whose parents brought them lawfully. Those who argue that we are anti-immigrant have also argued against our newly created ICE Victims of Immigration Crime Engagement Office, which, as Mark said, I now lead. What they have failed to realize, however, is that this office is not about pointing out the crimes of those unlawfully present in the country, but rather it’s about helping those who have been victimized, people who don’t understand immigration issues, people who want to know if the person that killed their loved ones will be deported, people who want to know what a detainer is, people who need our help. For the first time ever, a victim can call our office to find out how the complex immigration system works. Before that, they didn’t have that. A district attorney cannot explain to someone what immigration proceedings are, cannot explain what a notice to appear means, cannot explain what reentry is, cannot explain if the person is going to be deported before he or she serves a criminal sentence if they are convicted for the crime that they committed. But ICE can. Our officials can. So, for the first time ever, these victims have a representative that they can speak to at ICE, a representative that will hear them and will give them a voice. The VOICE Office cannot do away with the suffering some have tragically experienced. What it can and has done in some cases is give people hope, hope in knowing that they are heard and knowing that they matter. As I close, I want to challenge all of us to be mindful of what we say, of what we write. Words have power. They can change the world, they can save a life. MR. KRIKORIAN: Thank you, Barbara. People might have questions afterwards. I’d like to leave that to the end after our honoree has been honored and said a few words. So what we want to do now is the main event. Nothing personal, Barbara, but you were the warm-up act ‒ (laughter) ‒ and an excellent warm-up act. But the honorees today, there are two honorees, one of them is here representing his colleague, are Kevin Rothstein, who is here with us, and Mike Beaudet, who I am assured is not involved with Motel 6 if you remember those ads. They are an investigative team. Kevin is the investigative news producer, Mike the investigative reporter, currently at WCVB-TV. It’s the local ABC station in Boston. Before that, they were at the FOX affiliate in Boston. And they have broken over the years a whole series of major investigative immigration stories, both on state policy and federal policy. Kevin, who is here with us, started his career in print at a daily outside of Boston, which Kevin tells me is still in business, but it’s one of those suburban dailies that are dropping like flies, moved over to The Boston Herald, which is The Boston Globe’s competitor or maybe The Globe is The Herald’s competitor, however you want to look at that, in Boston, then moved to TV and has been in TV for many years and focuses on, the team really, focuses on exposing fraud and waste and abuse in, you know, in various areas, not just immigration, but others and also teaches journalism at Brandeis University. Mike Beaudet is not here because he’s in Athens leading a group of journalism students covering the immigration crisis, the illegal arrivals of asylum seekers in Greece. He started his career in radio, again in Massachusetts, covering the statehouse for many years, and at WCVB now also covers stories about government waste and corruption. What takes him to Greece is his role as teaching journalism at Northwestern University. And the team has covered a variety of stories on a variety of topics, not just immigration, but they’ve made a real contribution on immigration issues, which is why we wanted to recognize them. Kevin and Mike, for instance, investigated a state policy, Massachusetts state policy that enabled unlicensed illegal immigrants to nonetheless legally register automobiles, allowing them basically to, you know, operate under the radar. An exposure of that loophole prompted the state legislators to actually pass a law saying that only licensed drivers can register vehicles, which is hard to believe in Massachusetts, I would have thought they would have just, you know, they’d be rivaling California in giving away stuff, but maybe not. They also found out that the then governor of Massachusetts, the predecessor of the current governor, his name was Deval Patrick, was actually blocking implementation of what’s called the Secure Communities program, which is where now all police departments are hooked up to the system. When someone is booked and their fingerprints are scanned, as we all know from television, they go to the FBI. Well, this system also made sure they go to DHS. And so Governor Patrick was obstructing implementation of that, and their coverage of it, their exposure of that sparked a statewide debate that went on for quite a while. Kevin and Mike also did some groundbreaking reporting on a Cambodian gang member who had been convicted of murder, but because Cambodia wouldn’t take its own citizens back and the State Department, at least until recently, basically said, OK, the authorities were compelled to release the guy back onto the streets after a certain amount of time because of Supreme Court decisions. And so exposing that story, which they did, became national news and helped prompt congressional hearings and legislation even, although this is still an issue that hasn’t, as far as I can tell, fully been resolved. And then more recently, they broke a story on illegal alien drug dealers from the Dominican Republic pretending to Puerto Ricans, using stolen or borrowed or whatever identities of Puerto Ricans, meaning U.S. citizens, enabling them to get licenses and access welfare benefits and all the rest of it, again, in New England with a local focus. So these are some of the stories that, honestly, I’m not sure why national investigative reporters aren’t doing more of this sort of work. But as you’ll see from our list of past winners, a few years ago we had honored another local TV investigative reporter, that time in Indianapolis, who had done work on illegal immigrants getting IRS benefits, the additional child tax credit, for instance. This is a story that there’s no reason that ABC or CBS or NBC or CNN or somebody, I can assume MSNBC wouldn’t have done it ‒ (laughter) ‒ should have, you know, should have uncovered. And yet, then, as we see here with Kevin and Mike’s work, often it takes local reporters, whether TV or sometimes even in print, who are able to find and expose and shine light on these kinds of things. 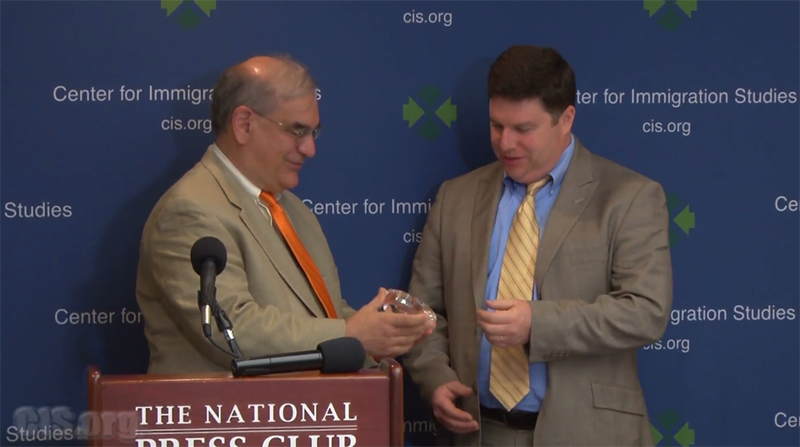 So, for that reason, we’re honoring Kevin Rothstein and Mike Beaudet with this year’s Eugene Katz Award for Excellence in the Coverage of Immigration. Where is it? Oh, there it is. I’m sorry. We can cut this out when we put it ‒ we won’t put this part online. So we have a little tchotchke that goes along with it. It’s a nice crystal clock for you. And we have one for Mike as well. MR. KRIKORIAN: So Kevin will say a few words, as few or as many as he would like. MR. ROTHSTEIN: Thank you. Thank you, Mark. I don’t think Jessica Vaughan is here. MR. KRIKORIAN: Not yet. Her plane got held up. MR. ROTHSTEIN: Oh. So I’ve come to know Jessica pretty well over the years. And if I could just say, I’m sorry she’s not here, but she is just ‒ she knows more about immigration than anybody I have ever talked to. She’s a great resource. And maybe the smartest thing she ever said was to tell me to keep my remarks brief today, so we can all thank her for that. I wanted to actually talk about one of the stories that you mentioned about Secure Communities. But excuse me, first, I do want to acknowledge one of my colleagues, Kathy Curran at WCVB Channel 5. She’s done quite a bit of work. She’s another reporter on especially the story about we call them identity imposters who assume identities and get a Massachusetts driver’s license. I worked with her for two years on that topic, just story after story on how the Massachusetts Registry of Motor Vehicles gives driver’s licenses to people under assumed identities. So I wanted to make sure I mentioned her. MR. KRIKORIAN: That will be next year. I did want to talk a little bit about that Secure Communities story because I think it’s illustrative of some of the issues that certainly journalists face, whether it be about immigration or really any other topic. And as Mark mentioned, I’m not an immigration beat reporter and we cover all kinds of stories, but this one about Secure Communities was, I thought, very illustrative of the problem that we encounter that comes from either the lack of information or the closed nature of sources of information. So that story started with a tip, as they often do, that there was this program that I had never heard of called Secure Communities, and it was basically a data transfer program, transferring fingerprint data from local police departments when they book somebody, and it was a sort of pipeline for these fingerprints to reach immigration databases, so as simple as that. It was also immensely complex because of the immigration debate that followed and the concern that it was turning local police into immigration agents, a debate I’m sure most of you anyway are familiar with. So we started asking around. And we were met with weeks of really silence. ICE, nothing. Governor’s office, nothing, nothing, nothing. And we thought our information was wrong, until after several weeks of persistence we finally got some information from ICE. We had an interview with ICE. And ICE was, at the time, looking for a memorandum of understanding with states to sort of flick the switch for this program. And Massachusetts was essentially ignoring it; not essentially, they were ignoring it. And that was our story. That night the story broke, the opponent of the governor called a press conference for the next day, he had a former U.S. attorney by his side, he was running for governor. He called a press conference, he said we need to get this program. There were public forums that followed, all kinds of discussion, all kinds of debate, some of it very heated, some of it inaccurate, no question about it, but the point being the debate started. And until then, until the information came out, nobody knew, nobody even knew about it. And I think one of the biggest issues facing journalism, along with everything that you’ve mentioned, shrinking budgets and tight deadlines and so on and so forth, the challenges that we are facing on top of all that is sometimes penetrating the incredibly closed nature of our state governments, our local governments, sometimes the federal government, and certainly immigration is no different than any other topic in that regard. So that’s all the remarks I have. MR. KRIKORIAN: Thank you, Kevin. Actually, I think immigration is probably worse. One of our fellows, I don’t think he’s here, David North, who writes on these issues of, you know, managing immigration benefits and visas and all this kind of stuff, he says, and he’s been doing something like this, working on government data and government bureaucracies, for a long time, he said it’s way worse in immigration, way worse. In fact, in some agencies they actually redact the name of the lawyers in various cases and the judges that were involved, that sort of thing, even though there’s no privacy issue there at all. So it’s almost certainly worse in immigration than in anything else. If people have any questions, we have somebody who probably some reporters might want to pigeon hole and ask questions of for Barbara. So if anybody has any questions, I can probably come up with a few myself, but if not ‒ oh, OK. Wait for the mic. Is that on? Q: Thanks. I’m Peggy Orchowski. I’m the congressional correspondent for the Hispanic Outlook magazine. I’ve written two books on immigration that Mark has endorsed, which is nice. I obviously have questions, but I was just wondering with you, Mr. Rothstein, do you belong to IRE? Are you supported by investigative grants? How is your broadcasting station funding your two years of investigations? MR. KRIKORIAN: Why don’t we give them the mic? MR. ROTHSTEIN: Well, that’s a good question. We’re just funded as a regular employee. But as you can ‒ so I’m employed by Hearst Corporation, just like anybody at any other Hearst stations. But it gets to the heart of why investigative reporting or any kind of enterprise reporting that takes, where it’s required, it takes some time to learn the topics and dig into things, it’s so difficult in sort of this day and age because it’s expensive. If you look at it from a pure productivity standpoint, do you want somebody turning out two, three stories a day or somebody turning out two, three stories a month, every two months or longer? So that’s the challenge. And hopefully we make the case, and I think it’s well heard, that in the age of the internet when information is so readily available everywhere, that unique content, including investigative reporting, is more valuable than covering a press conference that people can stream on their phones for example. So that’s the case we make. Hopefully my bosses are still convinced by it. MR. KRIKORIAN: I had a question for Barbara actually. Well, yeah, hold onto it. What’s the future for the VOICE Office likely to be? In other words, because you’re acting director, and I don’t sort of mean necessarily for you personally, but, I mean, how do you see it developing or changing or what are the plans for it? MS. GONZALEZ: Sure. Well, my real job is I’m the deputy assistant director for stakeholder engagement and the VOICE, so I will stick around regardless, which I am really happy to do. I think, you know, looking at this office right now is analyzing the types of calls that we’re getting. We have metrics, seeing volume, seeing the kind of requests and, you know, really figuring out what the victims need. The reality is that there are some victims that have expectations that we cannot meet. We are not a social service agency. We are a law enforcement agency. What we can do, however, is what I talked about earlier, is empower them with information, empower them with the who, what, when and where, in some cases, because, as all of you know, some cases may be protected by law or policy. VAWA cases, for instance, if, you know, somebody has applied for a benefit and other things, TEU visas, by law that’s protected information that we cannot give, even if it’s a victim asking for that. So, you know, I fully anticipate that not everybody will be happy and that’s just an expectation that we have. But I believe that at the core of this office is really just trying to help people. And, you know, we don’t provide social services, we are engaging, as I’ve explained it, as this is another stakeholder that we have never engaged with. We engage with law enforcement, we engage with the public, we engage with NGOs. Well, you know, the president through the EO said, well, guess what, you’re going to engage with victims and that is what we’re doing. So really, it’s engaging with them, listening to them, seeing what they need, referring them when they need social services to victims’ assistance specialists that work within ICE that could get them with those local community services. Is it psychological support that you need? OK, in certain states I can get you with certain people and our VASSs can do that. Is it funeral expenses? Well, it depends on the state what is, you know, allocated, et cetera. So we’ve only been, you know, around for a month. I fully anticipate that we have a lot of growing to do, a lot of learning to do, a lot of course corrections, as is with life. If you’re doing anything right, hopefully you’re being introspective, you’re learning and you’re growing and you’re changing and you’re evolving. And that’s what I tell my team all the time. And just seeing, you know, what is needed, hearing people and seeing, you know, the resources we have and how we can expand and shrink as necessary. MR. KRIKORIAN: – but space alien sightings. MS. GONZALEZ: Space aliens. Yeah, you know, it’s unfortunate. I have to say, you know, and, listen, I’m fine and I know everybody here is fine with people being for or against something. That’s what American values are about, that’s what our country is about. People can express their opinions and be respected. What I’m not for is people monopolizing a resource for people. And that’s what they were doing. They were monopolizing a resource, trying to clog the lines. That has luckily tapered off. You’re still going to have those people. And, you know, we respect people’s opinions and they can do that, but they should not monopolize this line which is really for victims who need help. You were going to ask about the space aliens? OK.
Q: Well, Barbara, I really appreciate the way you’ve framed the work of ICE in terms of not really being about punitive measures really, but about helping. Of course, you didn’t talk so much about all the people you’re helping in the United States, but we certainly, I think, our organization ‒ I’m with NumbersUSA, Roy Beck. We’ve always felt that so much work gets done on deterrence, it’s about saving lives because people do die crossing that desert and they have so many other things. So I guess I’m going to hit two things here. But one of them is I’d be kind of interested in ways that we could, as an organization, do more to magnify that message from ICE because that’s a great message. And for you, Kevin, there’s a couple of real old hands from newspapering in the room, one of them is still back in the corner, the gray-headed guy back there. When we broke in in the ‘60s in newspapers and working on local newspapers or local TV stations, there was some great stuff that was done in the local area, but was just kind of lost because it didn’t go anywhere, it didn’t matter unless a national newspaper did it or the network. I just wonder whether that’s one thing that might be a little better now, that you feel like a local TV station or a local newspaper, because of the internet and because of so many other things, may be able to ‒ your work has more national significance. And so many things, really, let’s face it, they happen at the local level. And, you know, you’re the guys that can really bring it out. What’s your feeling? Do you still feel like your stuff doesn’t maybe get the attention it should? Or did these investigative reports have national effect? Two thoughts on that. One is, when I made the jump from newspapers to TV, I did notice that the impact of what we were working on was reduced. I worked for The Boston Herald, which was not the primary paper in town, it’s The Globe, but even at The Herald, if you had a good story, you sort of broke a story, it would drive the news coverage in the area for the day, maybe not nationally, but TV and radio would pick it up, the Associated Press may pick up it. And then I made the jump to TV and I felt like we were doing the same stories, similar stories that would be in The Herald and, if they were in The Herald or The Globe, would have driven coverage, but they were broadcast and just dissipated. So I do still feel that’s the case to some extent. I will say that the impact of a story that any local outfit may do gets magnified really usually when an interest group picks it up. So sometimes it could be immigration, it could be law enforcement, and a lot of times that will magnify, get it out of the Boston area in our case. That’s been my experience. I don’t know about other stations. I don’t have a good answer for you, but that’s ‒ when I’ve seen stories sort of grow outside the region, that’s been it. MR. KRIKORIAN: Did you have anything, Barbara? So, you know, for me, the saving lives message is what drives me every day. Clearly, ICE has a vast footprint as far as all the various laws that we help enforce. But here, focusing on immigration, focusing on the fact that I always say it’s not a bale of dope that you’re talking about, you’re talking about a person. And I think that there’s a lot of irresponsible rhetoric all around. And I’m apolitical, I don’t care about politics, I’m a public servant, but I will tell you that I hear that irresponsible rhetoric and I think, instead of focusing the energy on talking about things that are not real, that are not happening, no, we don’t do checkpoints, no, we don’t indiscriminately stop people and say, wow, you look Hispanic, Barbara Gonzalez, can I see your papers, that does not happen. Rather than focusing energy talking on that, we need to talk about the real villains here, which are the smuggling organizations. We need to talk about the people that are dying every single day. We need to talk about the girls that are being raped every single day. And people don’t talk about that. It gets lost. In the headlines, it’s, you know, either you’re pro or against. You know, 50 percent of the people are going to love us a hundred percent of the time, 50 are going to hate us a hundred percent of the time. But in that conversation, that core message gets lost, which is people are dying. And people need to wake up and talk about that and get, like, just a movement worldwide. And when I’ve spent time in Central America, that’s what I did. I got out there and I talked to them about, number one, that every country has a sovereign responsibility to protect its borders. That when I landed in their country, they looked at my papers. So, when I was on TV, I said, just like you are protecting your border, we are protecting ours, right? And then you talk about that message of the stay home, stay safe sometimes doesn’t necessarily work, but the fact that the laws haven’t changed and if you come the wrong way the vast majority of you are going to be deported. So I think just creating that real conversation that is about people and, you know, folks dying is very, very important and it’s getting lost. MR. KRIKORIAN: We had a question here, Margaret, and then in the back here. Q: Mel Klein, Accuracy in Academia. I’m going to awkwardly try to fish three numbers out of one question. OK? Barbara, what’s your caseload? How many smugglers do we know of? And, Kevin, how many identity imposters are there in Massachusetts alone? MS. GONZALEZ: Sure. If you’re talking about the VOICE caseload, OK, VOICE caseload, we’ve had a couple hundred referrals of victims that have contacted us that have been referred to a community relations officer. And that’s the person that does the engagement to find out what they need and, you know, will make that connection with the victims assistance specialist if they need it. That’s the first thing. As far as the smuggling world, I can tell you when I was in the press shop and when I spent time in Central America, I mean, we had arrested hundreds of smugglers, I think, in, you know, just two years, a two-year period. We obviously count fiscal years and had seized millions and millions of dollars. I’m not sure what those numbers are now, but I can tell you that there’s really a robust effort by our agency on the homeland security investigations front to target these transnational organized networks because they are working without borders. Right? They are seamlessly operating to bring people over here. So what we’re doing is obviously diplomatically and, you know, working through embassies, is meeting with all these foreign partners where stationed overseas, homeland security investigations, and building these alliances and building training opportunities and having vetted units and such so that we can conduct simultaneous joint operations. We’ve done them throughout Central America leading into Mexico. So I think it’s a continual effort, both on the communications front and on the investigations front. And we all just have to keep on hitting them and hitting them where it hurts, which is their pockets. MR. ROTHSTEIN: That’s a hard act to follow. The answer to the question of how many identity imposters there are in Massachusetts is nobody knows. And that’s been the subject of the last story or two that Kathy and I have worked on where we’ve questioned the Registry of Motor Vehicles’ lack of interest in finding that out. Pete, and then Jerry had a question in the back and then we’ll wrap it up. Q: Again, a question for both of you. Kevin, what kind of pushback do you get when you do stories on immigration? I mean, do your advertisers get worried? Does the public deluge your station with angry reaction that could affect editorial policy, I suppose? And, Barbara, is VOICE ‒ I mean, DHS HSI covers lots of different laws, not just immigration. So does your group deal with the other parts of ICE enforcement agenda? MR. ROTHSTEIN: I don’t remember any significant pushback on stories we’ve done. I think we’ve been careful to separate opinion from our stories. If you’re doing a story about Secure Communities or identity imposters, it is what it is. I think I don’t know why we’re here. I think it may have to do with we just follow the story wherever it goes. We don’t have an agenda, we don’t have professional opinions on immigration. We try very hard to keep those out of the stories. We’ve included immigrants’ voices, we’ve included advocates for immigration. In our stories, we’ve interviewed victims of abuse of employees. So to my mind, anyway, we’ve covered things fairly and with some balance. I think there’s a sense that, I’m not saying I agree or disagree with this, I think there’s a sense that journalists don’t cover some topics because they’re afraid or they don’t want to for whatever reason. I don’t know if that’s true or not, but we cover what we cover and we make our case. MS. GONZALEZ: So our office is helping all victims of crime with a nexus to immigration. And that’s ‒ yeah, so because the way that we’ve characterized our office and how it stands separate and apart from the DOJ Office of Victims Crimes, because a lot of people have said that this office is a duplication of effort when in fact it is not because our friends at DOJ OVC are not experts in immigration, we are. So there are services for those types of people elsewhere, but felt, and obviously through the executive order we’re mandated, that we needed to assist those with a nexus to immigration. MR. KRIKORIAN: Let’s take one last question in the back and then I want to respect people’s time. Q: Hi. Kevin, I have a question for you on a point that Mark raised. Do you have any thoughts on why the paucity of investigative reporting, especially on abuses of the system, by corporate business interests as well as by migrants themselves? MR. ROTHSTEIN: Should I just answer? MR. KRIKORIAN: (Laughs.) That’s right. MR. ROTHSTEIN: I don’t, to be honest. I mean, if your question is have we ever been steered away from something like that, you know, no. Q: No, it’s really that you have seen some of the ways that the system has been manipulated, violated in ways that are systematic or seemingly could be identified by a watchdog reporter, and we just don’t see much of that. I was a reporter for many years myself, and this is one of my ‒ (off mic). MR. KRIKORIAN: Jerry has plenty of story ideas, I think. MR. ROTHSTEIN: So sorry I couldn’t be more helpful, but I don’t think they’re ‒ in my experience, 20 years of journalism, I’ve never seen a topic where there’s outside pressure to not do a story or to do a story, financial pressure on a news organization. That’s a legitimate concern and something to be watchful of. Just speaking for myself, I’ve never experienced it. MR. KRIKORIAN: OK, yeah. Maddie will get to ask the last question. This is Kevin’s daughter who’s here on a field trip. Q: Hi, I’m Maddie. My question is for Barbara. So I know you were talking about how the most important thing is that how people need help and how people are dying. How do you help them if they’re turned down or if they can’t get the help that they need? How does your organization help them do that? MS. GONZALEZ: That’s a great question. So you’re talking about the actual people that are not living in America and that want to come here unlawfully? Q: No, not unlawfully. But, like, if they can’t come, if they get turned down for the wrong reasons or if they get falsely accused of something and they can’t get in. MS. GONZALEZ: Sure. Well, there’s a lot of things, right? So luckily, because we’re the best country in the world, we have a lot of systems in place for people that could file for, let’s say, asylum. You know, if they’re being persecuted back home, there’s, you know, asylum laws. There’s refugee laws. And there’s also a lot of other ways that we can help people and it’s not just through my office or my organization. But as I was talking about, how you help, you know, empower people or save lives is through education. And one of the things that we do is go and spend time overseas and partner with local groups and talk to people about the dangers of the journey and talk to them about opportunities there and really developing opportunities in these other countries and working with them diplomatically. For instance, there’s going to be a conference soon in south Florida where you’re going to have lots of president for Central America who are going to be meeting, talking about what they can do to improve conditions in their respective countries so that people can actually stay. So there’s a lot of things that we can do, I think, and that we do do as a country just writ large to help people. MR. KRIKORIAN: Thank you, folks. I just want to emphasize the point that actually Kevin had alluded to. The point of our award is not to promote a particular point of view, which we have a particular point of view. I have no idea what Kevin or Mike or Barbara think about immigration and I don’t care. Because the point of this award is to foster, you know, informed or foster reporting, recognize reporting that fosters informed decision-making on this issue. And frankly, this is one where that’s sorely needed because the reporting on this has generally been pretty one-sided and pretty bad. And so I’d like to thank Kevin for coming, congratulate Kevin and Mike on their award. Thank you, Barbara, for speaking. I’m not sure how long they’re willing to remain here to be accosted by you if you want to talk some more, but I wanted to wrap it up now in case people have jobs to go to. Thank you very much and I think we’ll have the video of the event on the site at some point probably next week.